Maxwell Beach Residence is one of Barbados newest luxurious beach-front condominium property available for holiday rentals. Offering ultra stylish and contemporary beach-front living unlike any other, featuring some of the most high end finishing’s and furnishings in Barbados. Our South Coast location offers direct access to the quiet, pristine white sandy beach and to some of the best dining, shopping and nightlife in Barbados, including St. Lawrence Gap and the Oistins Festival. We are no more than 15 minutes away from the International Airport and the same from the main city and shopping centre Bridgetown. Our exact locale is on the Maxwell Coast Road, well secluded and tucked away from the busy main roads and traffic sounds. Offering 2 en-suited master bedrooms with King beds and one bedroom with Queen bed. Featuring specially designed Italian kitchen with granite marble counter tops with breakfast stools, fully fitted with kitchen appliances, double-door refrigerator, electric stove, coffee maker, toaster, blender and washer/dryer. Each villa also has its own private balcony with astonishing views overlooking the pool, garden area and the beautiful turquoise blue ocean and white sandy beach. We also include a complimentary airport pick up in a safe secure vehicle with a friendly driver and a welcome package for all our guests. Our villas are the perfect vacation home for families, friends and couples looking for a safe, comfortable, relaxing and stress free holiday. Wake up to a beautiful sunrise and breathtaking ocean views, relax and unwind at the end of the day listening to the sound of the beautiful waves, as the sunsets gently over the ocean. Turn each moment into a lifetime of cherished memories at Maxwell Beach Residence. Besides the great location and spectacular ocean view, this property is close to the airport, most attractions and only steps away from the beach. It is a safe, quiet and private property to spend a relaxing stress free vacation. It's easy to get around from this property being walking distance from the main street and 24 hour taxi service easily available. 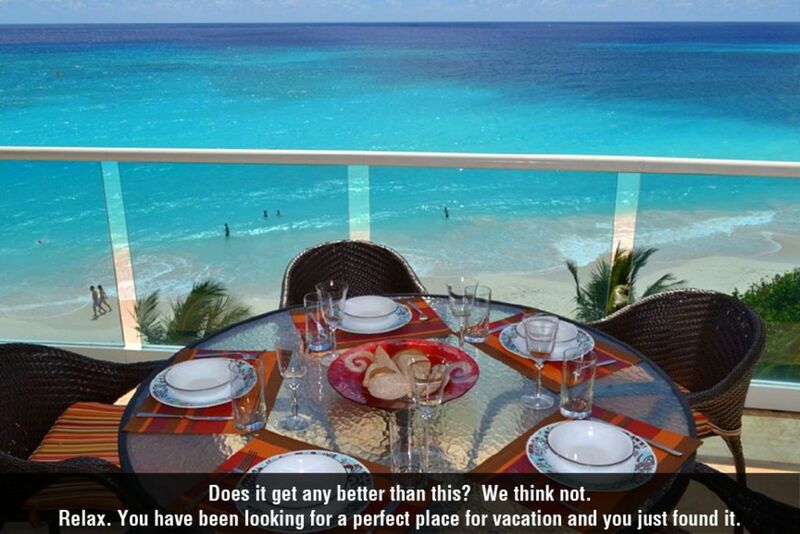 A fully equipped condo, the property has everything you would need for your vacation. The views from the balcony are breathtaking. It is perfect for relaxing and enjoying. The property stands on an uncrowded beach but also offers a pool, all so you can spend quality time with your family and friends. The property is conveniently situated close to nearby restaurants, outdoor bars, shopping malls, supermarkets, 24 hour medical clinic, bank, Oistins, and the famous St. Lawrence Gap. Air Conditioning in each bedroom and the in the living room/dining room/kitchen area, all with remote controls. Lots of towels provided for your comfort. All the linens and towels are upgraded and changed to new ones on a regular basis to make this a 5 star VIP experience for you. Beautiful and spacious living room with sofa, love seat and chair, and of course cable television and DVDs. Yes this is included and it has ice and filtered cold water dispenser. Of course, Barbados has the cleanest water on this planet. We also have a small beverage fridge for your wines and beers. Everybody in the family joins in for cooking in Barbados. In case you want to microwave something, it is there. All types of dishes and utensils included for your cooking and serving pleasure. Al fresca dining on the patio. Fine dining on the formal dining room. Breakfast and lunch around the main cooking area. Choice is yours! The most beautiful patio overlooking the beach and the Caribbean Ocean with lounge chairs and outdoor dining and eating. Al fresco dining at its best. Our property is fully wheelchair accessible, and we love to help you make the most of your visit. For further details on this excellent beach front property, please visit our website . Please feel free to contact Selma Cheek, our Customer Service Representative, to find more about the property, the amenities available or its features. She is always available to answer any questions you may have and will be happy to assist in any way she can. Our property is located close to the famous Oistins Fish Fry, well known for the best seafood, the Barbados Golf Course and the popular St. Lawrence Gap known for its many dining, entertainment and nightlife.